Artist Katrien Vanderlinden has painted colourful shapes inspired by toy bricks onto a basketball court in the Belgian city of Aalst. 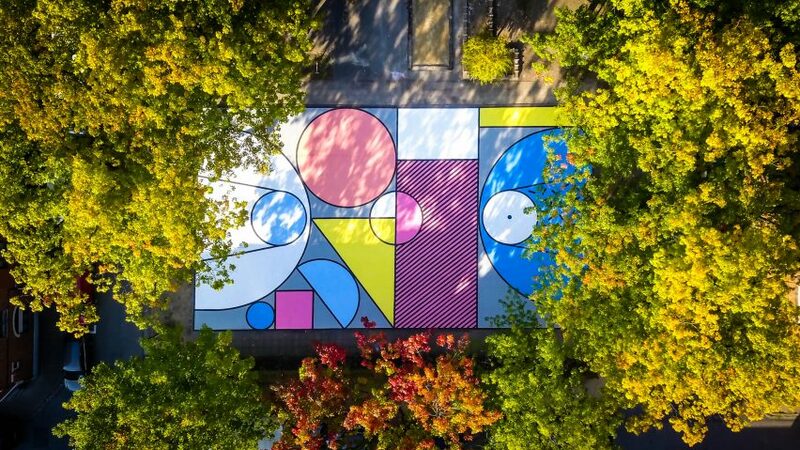 Vanderlinden's Ezelsplein mural is based on a children's mathematical reasoning game named Logical Blocks, which comprises squares, rectangles, triangles and circles, in different shapes, sizes and colour. Inspired by these shapes, she added triangles, circles and rectangles in between the traditional court markings – creating spaces for the local children to play other games. Block colours in hues of blue, yellow and pink were chosen to fill in the shapes, as an "ode" to the bold and graphic Memphis art movement. "I was inspired by an image of a box of building blocks. I loved the simple lines and shapes – squares, rectangles, circles, triangles of all sizes – that all fitted in this box," Vanderlinden told Dezeen. "I like the fact that you can play the basketball game and that this design creates extra spaces for children to make up their own games." The artist designed the project to be best-seen from above, in response to the increasing popularity of drone photography of basketball courts on social media. A bird's eye view of the mural looks like the different blocks stacked together in their box. "Drones are also widespread nowadays, so to make an artwork that can only be viewed as a whole from an aerial point of view isn't such a crazy idea," she said. Vanderlinden's mural takes inspiration from similar inner-city basketball courts, also known as hype courts, which have been spruced up with colourful makeovers. The ongoing trend has previously seen artist Kaws paint his signature motifs across two basketball courts in New York City and Willian Lachance create a giant mural across a series of basketball courts in a St Louis. As with these earlier projects, Vanderlinden wanted to breathe new life into an inner city area quickly and cheaply. She proposed the idea to Aalst City Council who then assigned her with the city's grey tarmac Ezelsplein court next to a home for refugee children as her blank canvas. "It's a very simple way to give a neighbourhood a facelift," Vanderlinden told Dezeen. "These Hype Courts bring different domains together: sports, art, culture and youth." "When you walk down the street everything is grey: the streets, the facades of the houses, even the sky is grey," she explained. "The fact that you can bring colour in the everyday life of people is just amazing." The Ezelsplein court paintwork was completed within two weeks, thanks to the help of 10 volunteers from the local community.